Toyota RAV4 (ZCA20W/ACA20W). 2000–5 (prod. n/a). 3- and 5-door SUV. F/F, F/A, 1794, 1998, 2362 cm³ petrol, 1995 cm³ diesel (I4 DOHC). Second-generation RAV4 with Toyota Corolla (E120) components. Larger than before, now into the class 3 segment. 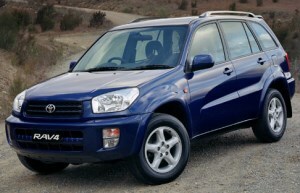 Improved quality compared to original RAV4, and a hit in export markets, though less successful domestically. Diesels for export only.